Examples of branding, marketing, and function in a magazine's website. Monthly articles are added, categorized, and tagged - creating a dynamic community site. The prior website was designed without a content management system, so required expertise in html and ability to ftp from a workstation. That made updates laborious, and at the schedule of one webmaster. Redesigned for a WordPress environment, several trusted individuals can make minor or major updates, based on their urgency and skills. My re-design had several goals: 1) Produce a professional website, up to the standards of such a fine publication, 2) Combine the functions of the necessary site components into one package, 3) Develop the site completely in a self-hosted Wordpress system, so that in the future - anyone with minor training could continue to manage or develop this site. All goals were achieved, and the the Publisher, staff, and subscribers are very pleased. I continue to manage the site by adding monthly articles, changing banner ads, updating the directory, and updating/developing pages as needed. 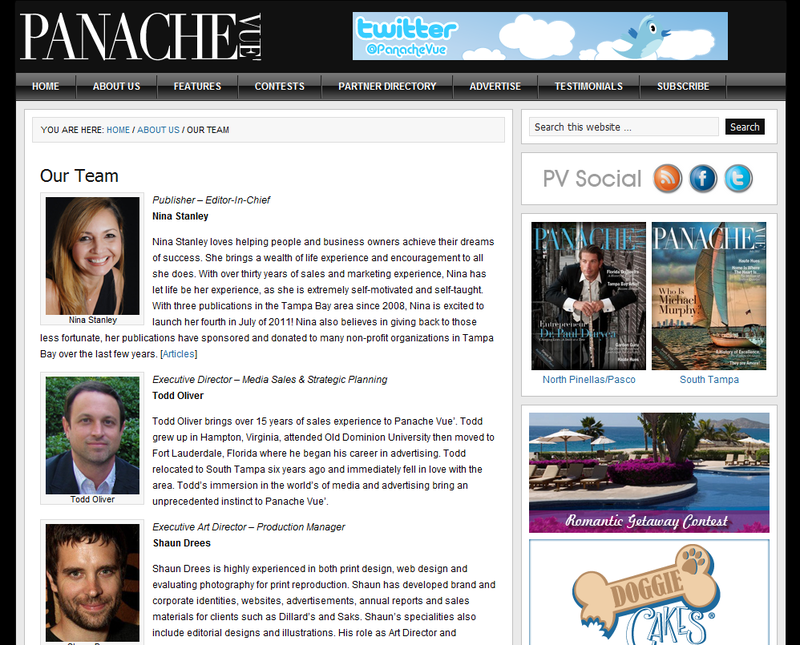 The Panache Vue' Logo was designed by Shaun Drees. I enhanced a purchased theme with custom graphics, content, and plug-ins - as the theme perfectly matched the functional and visual goals for this site. The original website, which was static, had nine pages in the Google search engine. This site, which included many new pages, categories, tags, and dynamic content generated over 150 pages found by Google in just over a week. 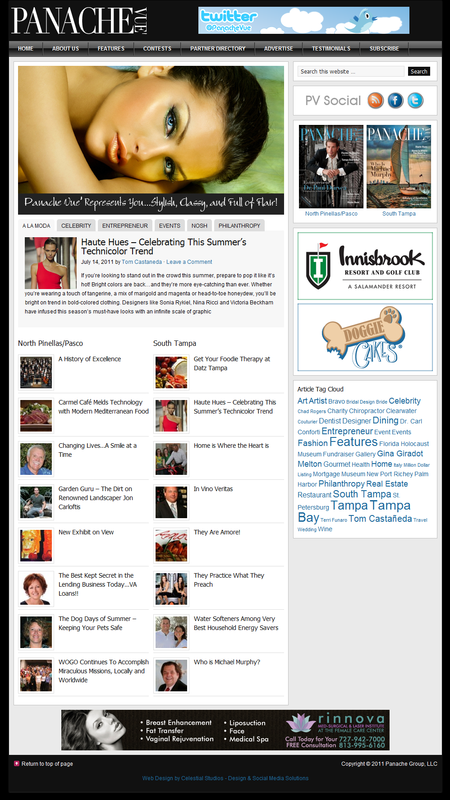 This screenshot shows the entire homepage, including rotating banners, dynamic article excerpts from our main features, and two columns of articles from the current magazines for North Pinellas/Pasco and South Tampa. The articles are coded with categories for year, publication, and issue - I simply change the issue and the homepage updates itself. The redesign, includes bios and photos of each talented staff member. A page of featured writers will be included in an update. Great writing and photography makes for excellent web content. Eight to sixteen new articles are added monthly, along with photos, and links to external content. Standard and creative photo sizes are used to create interest. In the example above, I felt the article deserved this long, vertical photo. 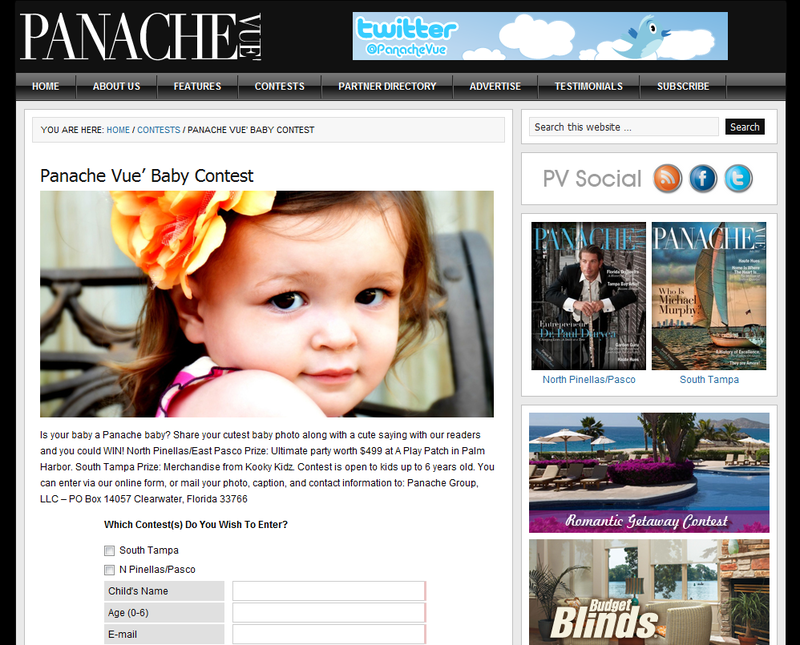 The magazine generates a lot of interest and with it's monthly contests: Baby, Kids, Pets, and Romantic Getaway. The original website included information on e-mailing photos, entries, essays for these contests, but I included forms for each one. 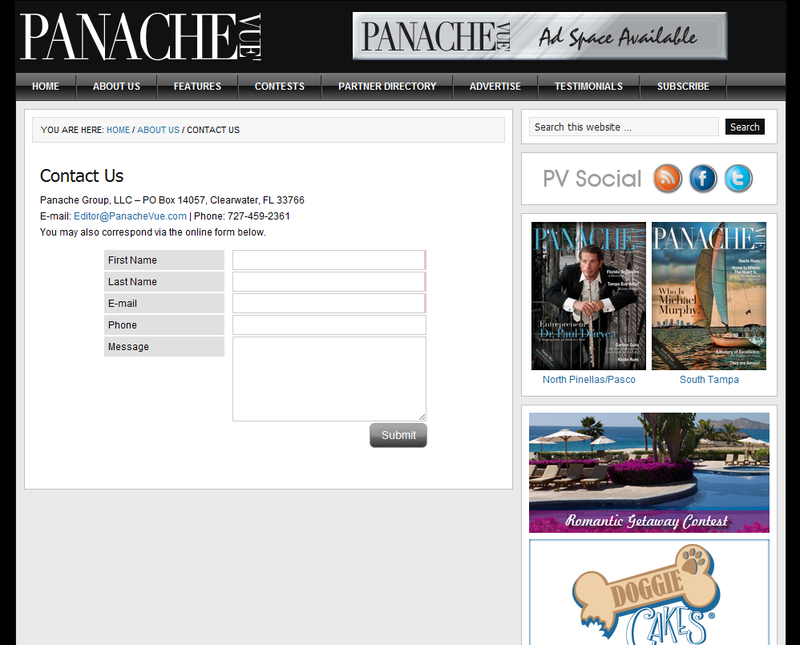 The results are automatically stored in a database, and e-mailed to the staff at Panache. Readers can now upload photos, and essays (in the case of the kid's contest) right on the website. The volume of entries has increased significantly. As so many nice pictures are available, a slideshow rotates the images on the contest pages for visual interest. A massive directory of partners and advertisers was included in the website update. Companies are cross categorized, and include all contact information, and social media links. Google maps is integrated into the search results, providing maps and directions for each entry. Advertisers have the ability to include a logo and company marketing language/photos for an additional fee. Forms were created for contacting the magazine, job applications, digital subscriptions, and all contests. Here's an example of the styling. 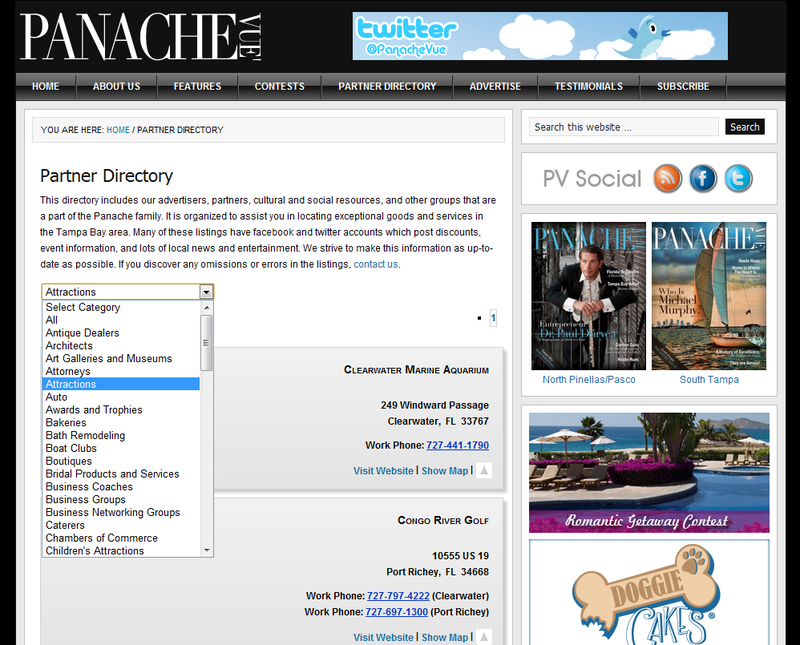 The results are automatically stored in a database, and e-mailed to the staff at Panache.